Apple Ipod is a globally popular portable media player designed and marketed by Apple since October 23, 2001 and has been servicing everybody with its high quality music experience. Its among the top creation of the previous decade(2000-2009) and still it the best. You need itunes to add and sync the songs in Ipod. So, handling and managing Ipod with itunes can be a hectic job. On these cases,you might find it difficult to add and sync your playlist on your Ipod and need of some alternatives to apple itunes arises. Here’s a post at your sevice providing you with 10 best alternatives to sync your Ipod without itunes, Hope you will love any one of them if you are really in the search of itunes alternatives. 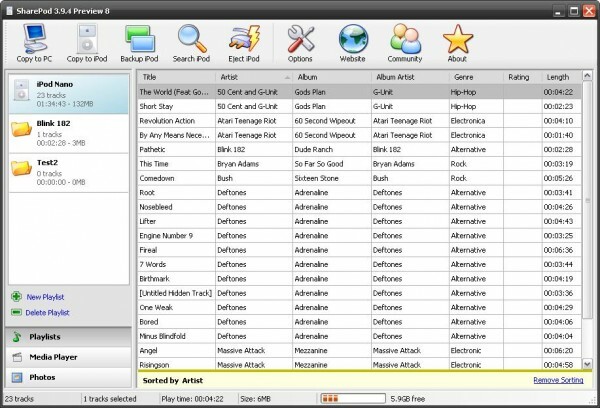 Sharepod is a free software for your ipod that helps you add and remove music, videos, playlists and artworks on your iPod. This free software also backups your favourite tracks that you cant lose onto your computer and also imports them automatically onto your itunes library and also sharepod can run straight from your ipod so that you can use it at your school, work and from anywhere you and your ipod are. Winamp is just like the common media player software for just playing audio, watching videos and no more, I used to think so. 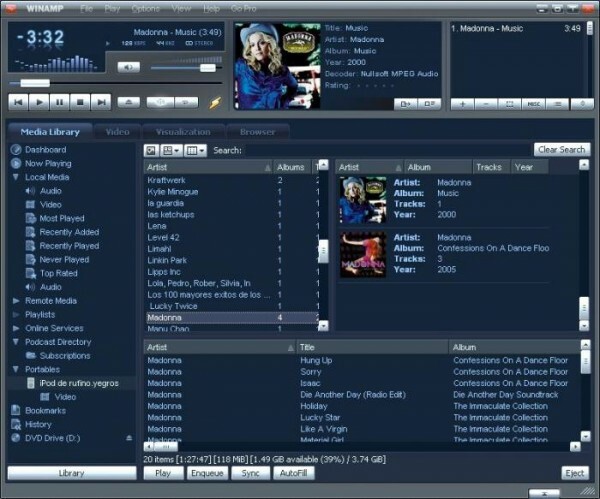 But in reality I find Winamp more than this. Winamp can also be used as the alternative of itunes for syncing songs on your Ipod with some easy steps. The newer version of Winamp not just only supports improved ipod sync support but also it has new itunes library import. You can learn more about the Winamp media player at the Winamp features page in the ordered list rather because truly there are many which I cant include all here. Rhythmbox is also a free music mamagement application inspired by apple itunes. It is designed to work well under the GNOME Desktop and based on the powerful GStreamer media framework. It not only just transfers music to and from iPod but also supports music transfer to and from MTP, and USB Mass Storage music players. It also displays album art and song lyrics downloaded from the internet and much more other features too. 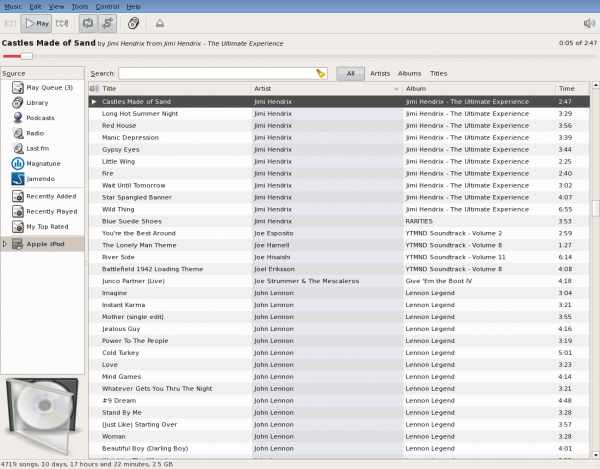 Mediamonkey said to be an easy-to-use music manager / jukebox for serious music collectors. 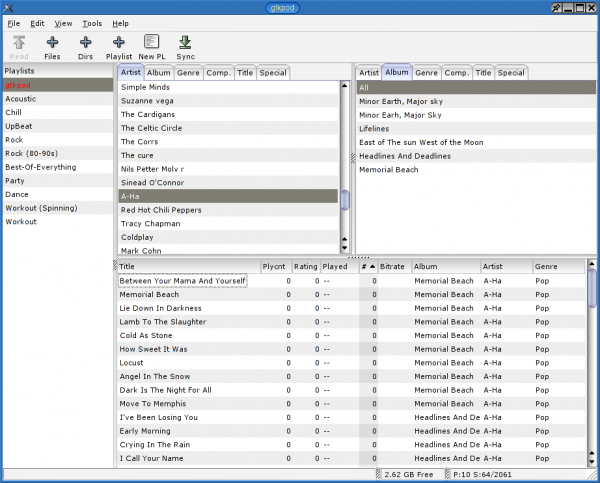 It catalogs CDs, OGG, WMA, MPC, APE, FLAC, WAV and MP3 files. It also looks up Album Art and data via Freedb and the web. 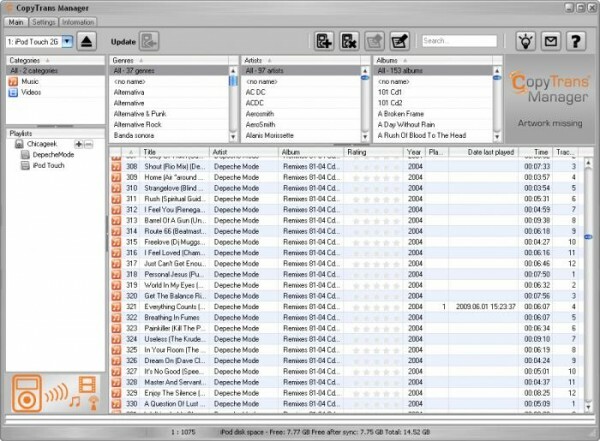 It includes a tag editor & file renamer to organize your music library, a CD ripper & audio converter to save music, and a playlist editor to create music mixes. Plus, it levels volume, supports Winamp plugins and burns CDs. Besides this it also syncs music with iPods, iPhones and MP3 devices. Amarok is among the most popular alternatives for transferring files and music between your computer and iPod. Ararok is available for almost all popular operating systems like Linux, BSD, Mac and Windows. It includes all types of ipod models and also Ipod touch and Iphone too. This software is free to download for any operating system and compatible with all types of music and video files. Copytrans manager is supposed to be the faster, lighter and free alternative iPod manager than the apple’s default itunes player. You can add music & videos to iPod, edit song tags and artworks, create and organize iPhone playlists, preview tracks with the integrated music player. Its also supports Ipod touch, Iphones and even for Iphone OS4. 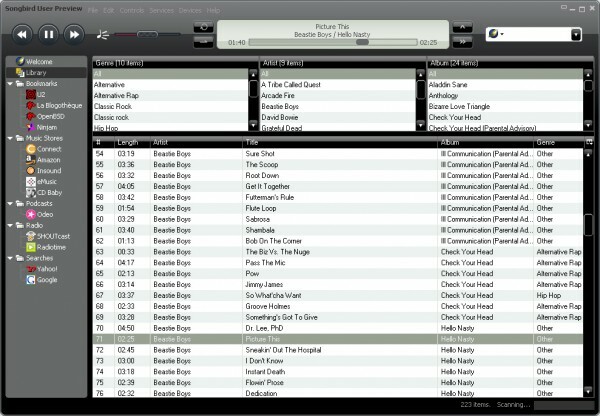 Ephpod is also among the free software for Windows and Linux to make interaction between your Ipod and your computer. 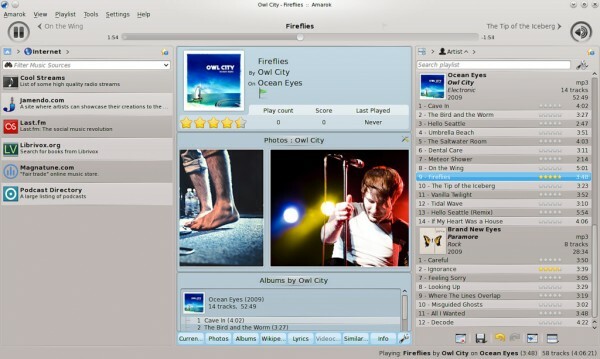 EphPod is also very famous for its capacity to download songs and playlists quickly. 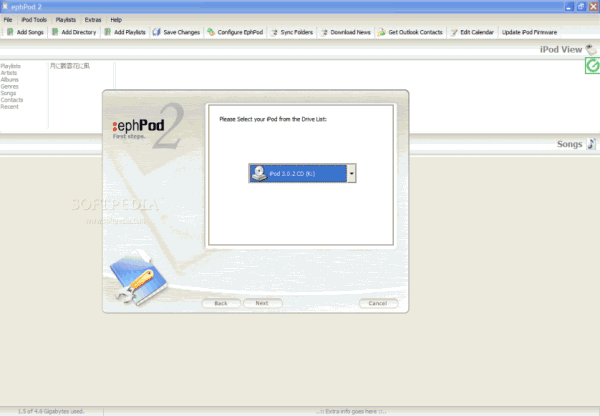 Ephpod supports all types of ipod models leaving the newer models of Ipodtouch and Iphones. It is compatible with music files and also with outlook contacts. EphPod can also download the latest news, weather, e-books, and movie listings to an iPod. 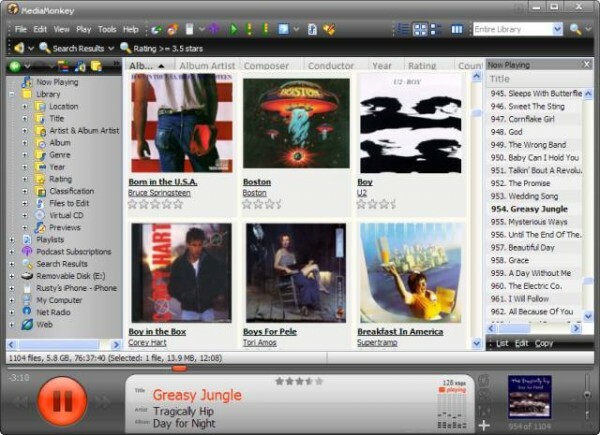 Song bird is like a winamp which is a free audio player and web browser that allows you to surf the internet, download the music and play the music itself. The most valuable thing that the songbird can do is that it can easily sync and manage content on an iPod without iTunes. Yeah, IPod users can easily do it without Itunes. Itunes got fired! It is truly a media player and manager for social web. You can easily download the songbird for free by visiting its official website. GTKpod is also a free and open source software which supports the iPod mini, iPod Photo, iPod Shuffle, iPod nano, and iPod Video. You can add MP3, WAV, MP4 and various video files to the Ipod. You can easily view, add and modify the cover art and also you can create and modify playlists, including smart playlists. It can also work offline. GTKpod can be downloaded from its official site. Yamipod is also among the freeware applications to efficiently manage your iPod under Mac OS X, Windows and Linux. It can be run directly from your iPod and needs no installation. The best part of Yamipod is that it doesn’t require any installation. It also recognizes your Ipod and MP3 and AAC files can be directly copied from/to your Ipod. Besides this playlist support, auto-download new versions, built in music player, News RSS and podcasts to iPod upload, multiple iPods support and Last.fm support are the best part of Yamipod.